Create your own custom cake pan to wow your friends. Decorate the top with any image you like. The cake pan / casserole dish is a true conversation piece. Decorate and enjoy! Heavy gauge steel cake and brownie pans feature a non-stick, FDA-approved, white ceramic coating. Ceramic-coated pans are safer and greener than Teflon. They resist flaking, and don't release toxic fumes when heated. Standard baking pans have white lids and bottoms, and measure approx. 9" x 13 1/8" x 1 3/4" deep. 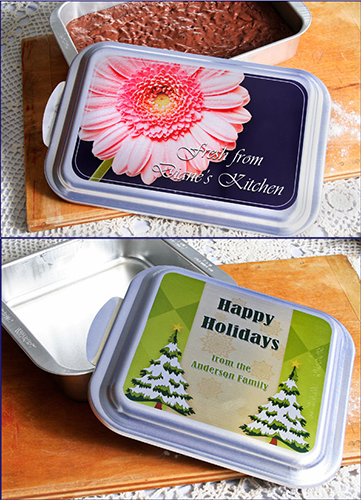 The contemporary style white lid can be printed to within 1/2" from the edge.